When is cancer not really cancer? While early cancer detection may offer a survival benefit, increasing numbers of ‘pre-cancerous lesions’ are also being identified that will never develop into lethal disease. These ‘pre-cancers’ are often treated aggressively to prevent potential progression into invasive cancer. To be able to accurately distinguish indolent from aggressive ductal carcinoma in situ (DCIS) in order to reduce over treatment and life-long side effects remains a major scientific challenge. Ductal carcinoma in situ (DCIS) is a prime example of potential overtreatment. DCIS is frequently detected by screening mammography, accounting for one quarter of all breast cancers diagnosed today. DCIS is usually treated similar to invasive breast cancer with surgery, radiation and hormone-blocking medicines. Despite newer research concluding these interventions provide no difference in survival, aggressive ‘cancer’ treatments remain the “standard of care,” and many women world-wide are faced with the life-long emotional, physical and financial consequences of aggressive treatments. Understanding how DCIS evolves and developing markers for which DCIS may or may not progress to invasive breast cancer, are pressing needs for the tens of thousands of women diagnosed with DCIS each year. PRECISION is an international collaboration building on multiple studies conducted in the UK, Europe, and the US over the last two decades. PRECISION aims to establish tests to reduce the burden of unnecessary surgery, radiation and hormone-blocking therapies used in managing DCIS, reducing overtreatment without compromising the excellent outcomes for DCIS presently achieved. 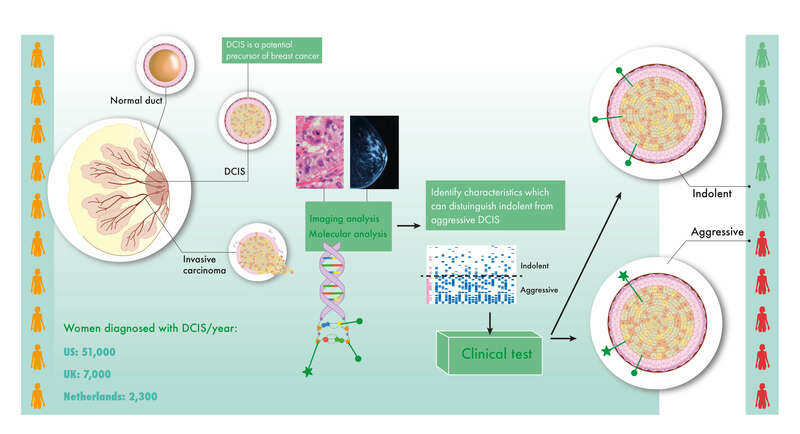 PRECISION will use a range of established and innovative laboratory methods applied to DCIS pathology sample collections to identify and validate features distinguishing aggressive from harmless DCIS. The Patient Involvement Panel is involved in the whole project lifecycle.